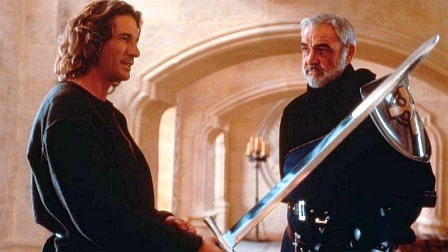 First Knight was well researched and at least makes a decent attempt to be different from similar films. The beginning scene where children hide underneath a house helps with the authenticity, but then the typical, and predictable, battle between the bad, rich oppressors and the noble knights begins. John Gielgud’s role as Oswald makes a great addition to the perfect cast. 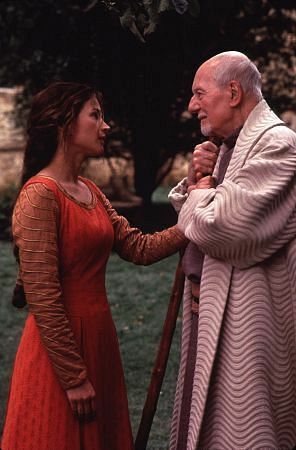 It’s very believable that Guinevere (Julia Ormand) would fall in love with King Arthur (Sean Connery) who gets a great entrance in a classic role in this Arthurian legend tale. Jerry Goldsmith’s musical score and Adam Greenberg’s cinematography are impressive. Director Jerry Zucker, mostly known for his comedic films, stresses entertainment and showmanship, but the logistical and battle strategy misses (e.g. not wearing helmets) diminish the level of emotion and escapism the audience feels. Zucker was definitely out of his element during the fight sequences and should have relied on an experienced assistant director. The medium and close shot action was better with some good swordplay. Equal appeal for male and female audiences made this one popular at its release. Mildly enjoyable and audiences get two hours and 21 minutes. Recommended with reservations (** out of four stars) and rated PG-13 for some brutal medieval battles. This entry was posted in 1990s Film Reviews, Film Reviews and tagged Film, First Knight, King Arthur, movies, Tall Writer. Bookmark the permalink.